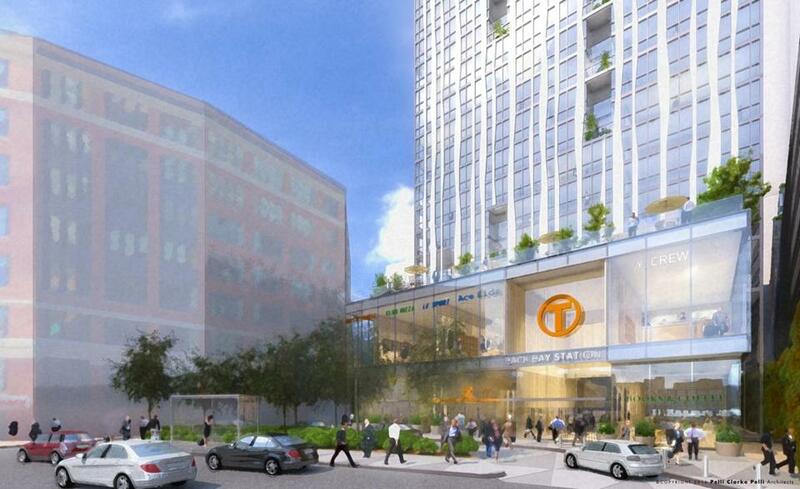 A rendering of the Boston Properties Inc. plan to transform and expand the Back Bay MBTA station. 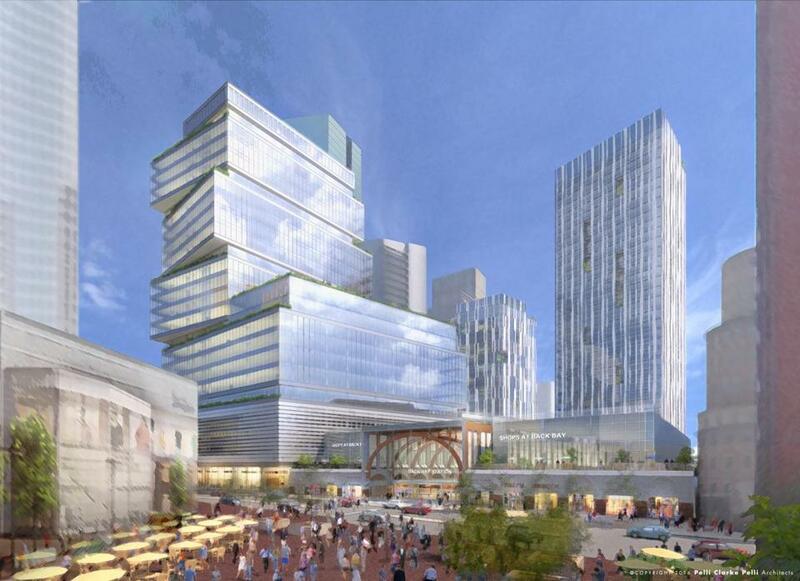 The dark and dumpy Back Bay MBTA station and its gray surroundings would be transformed into a bustling retail hub topped by striking glass towers as part of a billion-dollar redevelopment by one of the city’s largest real estate companies. Boston Properties Inc. on Tuesday unveiled detailed plans for a massive remake of an entire block in the Back Bay, anchored by an unusual twisting office building that resembles a series of glass boxes stacked at odd angles. The wall of forbidding concrete along the corner of Dartmouth and Stuart streets would give way to bright storefronts at the base of a 26-story office tower. 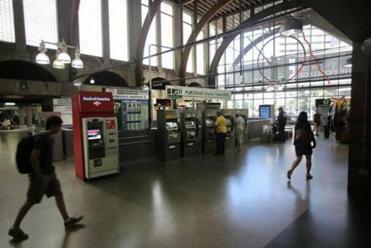 The concourse in the adjacent station would be cleaned up, and the MBTA building expanded with a new floor or two that could house a supermarket and department stores. The footprint of the project is huge: a long city block between Dartmouth and Clarendon streets that includes the train station and a little-used bus plaza and an adjacent garage with about 2,000 parking spaces. The new complex would total some 1.26 million square feet and also would include a pair of mid-sized apartment buildings on the Clarendon end. It’s still years away, but the size and central location of the project would go a long way to filling in the “high-spine,” a long-envisioned plan of tall buildings that would run along the Massachusetts Turnpike and give Back Bay its own distinctive skyline. It would rise a block from a 26-story office tower John Hancock will build, and a 31-story condo building is planned next door at 40 Trinity Place. Not far away, the tallest building Boston has seen in decades — 61 stories — is going up at One Dalton Street. A developer has submitted papers to build a 1.4 million square-foot complex of office, housing and retail space over the T station. And on the ground, the Boston Properties project would help reconnect a portion of the Back Bay and the South End that were severed by the highway. “It should be seamless, to really tie these two communities together,” said Bryan Koop, Boston Properties executive vice president. “We’ve seen what happened when we linked the South End to the Back Bay through the Prudential Center. In some ways there’s a more powerful link” at Back Bay Station. Boston Properties is planning improvements (shown in rendering above) to the concourse, including renovating bathrooms, expanding waiting areas, and adding lighting and retail. Boston Properties has been plotting this project for several years. One of the nation’s largest office landlords, Boston Properties took control of the Hancock Garage when it bought 200 Clarendon — formerly known as the John Hancock Tower — in 2010. 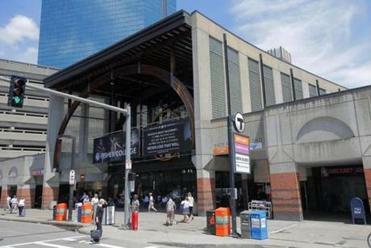 Then in 2014 it signed a deal with the MBTA to renovate and run the train station in exchange for air rights above it. Now it aims to combine the two properties to create a more user-friendly experience for the 30,000 commuters who move through Back Bay Station every day, and for thousands of pedestrians on the streets around it. The station is also a front door to Boston for many Amtrak riders, Koop notes, and a key point in the street life of the city. The concourse of the station, as seen in 2015. Meg Mainzer-Cohen, president of the Back Bay Association, said the business organization has long been pushing to improve the street life in that area, and is pleased so far with what Boston Properties has proposed. Koop expects it will take a year to win city approval and state environmental permits for the project. Boston Properties expects to break ground once it signs a large office tenant that can anchor the 575,000 square foot building on Dartmouth, he said, or when the company sees enough demand for one of the residential towers. Market conditions will determine if those towers will be apartments or condos, Koop said. The developer has also not determined whether it will include its affordable housing requirements on-site, or fund those units elsewhere in the city. Boston Properties filed an initial notice of the project with the BRA on Dec. 29, days before stricter new rules went into effect governing how big developers in the city must finance affordable housing. 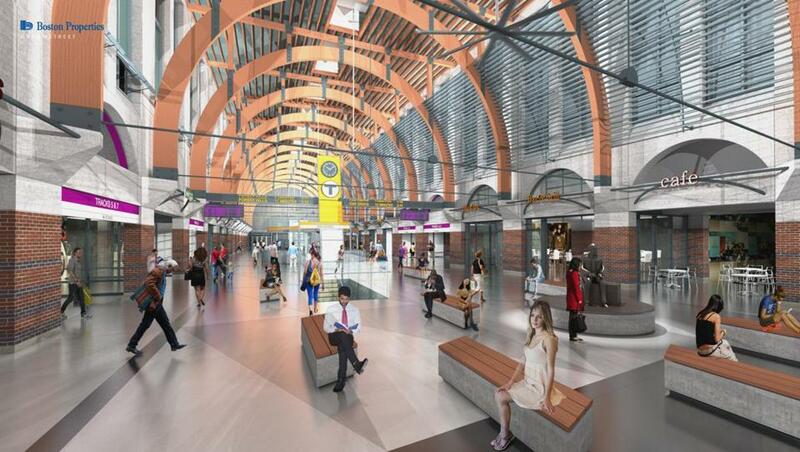 Boston Properties is also planning $32 million in improvements to the station concourse, including renovating the bathrooms later this year, expanding waiting areas, and adding lighting and retail. Those upgrades will likely help draw more passengers to use the station, said Rafael Mares, vice president at the Conservation Law Foundation. Building above multiple train lines and the Massachusetts Turnpike — without closing either — adds complexity to the project, Koop said. And Boston Properties plans to demolish part of the 2,000-space Hancock Garage and then rebuild it within the base of the new office building, without shutting that facility down. Its filing with the city even raised the prospect of closing the westbound ramp to the Turnpike from Clarendon Street, though that decision will ultimately be up to state transportation authorities. A spokeswoman for the Mass. Department of Transportation said the agency plans to study the issue. All that is why it helps to have an experienced developer such as Boston Properties running this project, Mainzer-Cohen said. Koop pointed to his firm’s experience expanding the Prudential Center with a new office building, and pulling off complex work in Manhattan. Market conditions will determine if the new towers will be apartments or condos. Tim Logan can be reached at tim.logan@globe.com. Follow him on Twitter @bytimlogan. Jon Chesto can be reached at jon.chesto@globe.com. Follow him on Twitter @jonchesto. Correction: Because of a production error, an earlier version of this story credited the wrong firm with designing the image of the proposed new concourse at Back Bay station.